Find great antiques on bidorbuy with the Rare Finds showcase. Collectors of English porcelain will rejoice at this beautiful and rare 1940 Royal Albert Rosedrop Bone China set of six tea cups and saucers. If your fancy is tickled by the classic porcelain ware of the East, then consider this antique Samurai tea cup and saucer made in 1891. 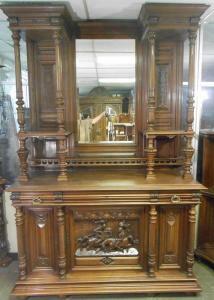 Most modern furniture cannot compare to the craftsmanship of quality antique furniture. For those of you feeling rich,consider buying this exquisite Renaissance style cabinet, made in 1870 from precious walnut wood. The French style continues with another fine piece that all collectors will consider, a smaller decorative French display cabinet. Occasionally, mysterious items become available on bidorbuy. Such is this old Arabian scimitar, worn by time, but still a battle ready blade. Some items are valuable for the story they tell. Such is the case with this 1892 Single Shaft Kruger Pond Set in jewellery brooch.Read the listing description to find out the story behind this interesting piece. Fans of Rome can enjoy owning this coin of the Emperor Gordian from the 3rd Century BC.